The CIA has offered good fodder for movies for many years, whether the American intelligence folk are being portrayed as evil, good or, as with Felix Leiter in the Bond movies, worthy only of acting as sidekick to the "real" spies. Still, a good spy thriller is pretty cool to watch, and if you're looking for a couple of interesting takes on the CIA adventure that reflect their respective decades and cultural setting very well, 'Taken' and 'Three Days of the Condor' are good choices. 'Taken' is a pretty good modern techno thriller, despite some plot elements being just a tad too convenient to allow for a true suspension of disbelief. It stars Liam Neeson as Bryan Mills, a recently-retired CIA employee who has moved to California to be closer to his estranged daughter, Kim (Maggie Grace). He's given up everything to get a second chance with her, unfortunately over the objections of his ex-wife, Lenore (Famke Janssen). We don't initially know what he did with the CIA, though an early part-time gig he takes offers us hints as he keeps a singer safe from an abduction attempt. When his daughter asks for his blessing on a trip to spend the summer in Paris with her girl friend, he's against the idea. He's been around and has seen what the world has to offer (so far as its seamier side is concerned, at least) and he doesn't think a teenager should be poking at that particular fate with a pointy stick. But she, and the ex-wife, does. So he relents eventually, which ensures we get more than a 15 minute movie. And Kim and Amanda (Katie Cassidy) head happily off to France and a vacation that includes a lot more European action than they'd let on to Bryan – much to his chagrin when he finds out. But within minutes of arriving in France they're naively sharing a cab with a nice-looking boy who turns out to be a person of hench in a high powered white slavery ring that preys on just the type of naive girls Kim and Amanda personify. Fortunately, Kim was checking in with Dad via her cell phone when the thugs break into their apartment and grab Amanda. Bryan gives Kim some advice aimed at helping her through the abduction ordeal, then uses the phone's technology after the fact to help track down the perps. Bryan has a window of only hours to get to Paris and save the girls and, thanks to his ex-wife's rich new husband, he sallies forth in a private jet to take on the white slavers who, he learns, have been operating with virtual impunity in the City of Light. Then the story goes from gritty techno thriller to action/adventure, moving along at breakneck speed for the remainder of its rather short hour and a half. It doesn't take us long to learn that Bryan wasn't just some desk jockey for the CIA: if anything, he out Bonds James and is fully competent and – since this is highly personal – more than willing to do whatever it takes to rescue Kim. Neeson is the film's biggest asset. He has great presence and enough thespian skill to get us through this warp drive-speed plot without noticing that he has basically laid waste to a lot of stuff whether he needed to or not. Well, come to think of it he probably did need to, since he was one guy against what appears to have been the entire European underworld, but thanks to Neeson we buy it rather than just laugh at the apparent absurdity of one man taking on so many and winning in this manner. Of course we shouldn't be surprised: he was a Jedi Knight once! The violence is a bit over the top, in a "shoot first and ask questions later" way, and if your manner is mild you probably won't like its graphic nature. But taking Taken on its own terms, it does work. 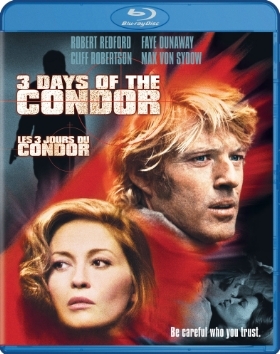 It works as a Blu-ray, too, more so than the rather Spartan Three Days of the Condor. Fox has given the movie a nice treatment that starts off by offering you the choice of watching the original theatrical cut or the unrated version that's about two minutes longer (and undoubtedly those two minutes feature a lot of blood). The 1080p picture quality (2.40:1 aspect ratio) is very good, with good colors and contrast and depth. Darker scenes, of which there are many, lose some of the detail, but over all it's a good video experience. As usual, Fox provides a dts-HD Master Audio 5.1 Surround track and it's in-your-face and immersive, just like you want with a flick such as this. Channel separation is excellent as the ordnance zips around the home theater, with the rear channels used often and well. Low bass is wonderful, and dialogue is nearly always audible easily. Extras include a pair of audio commentaries, one with director Pierre Morel, cinematographer Michel Abramowicz and stunt guy Michel Julienn, and the other by screenwriter Robert Mark Kamen. The group chat is in French, with English subtitles, which could be off-putting, while the Kamen commentary (Kamentary?) does a pretty good job of imparting info on the plot, casting, and the use of such explicit violence. There's also a short "Making Of" featurette that that's pretty standard, though at least it's offered in high definition. It includes interviews with director Morel, writer Kamen, stars Neeson, Janssen and Grace, as well as other crew members. It's okay, and certainly better than nothing. "Avant Premier" (also in HD) is a very short look at the film's premiere and is about as exciting as that sounds. Storyboard-to-Screen: "Inside Taken" (also in HD) gives you a half dozen comparisons taken (no pun intended) from some of the key action scenes, with the storyboard vision on one side and the final version on the other. 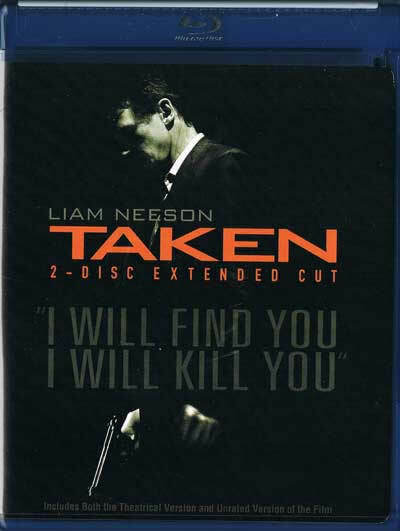 Taken comes with a second disc that includes a digital copy. Not a lot of extra stuff, but not too bad - and far more than you get with Three Days of the Condor. That flick is your typical 1970's paranoia story, but it's a good one and it works well. And it's an interesting counterpoint to Taken, with a very different look at the CIA. Robert Redford is Joe Turner, aka Condor, a CIA analyst whose job is so mundane and insignificant that he has trouble remembering his avian code name at first - let alone why he even needs one. Unlike Neeson's ex-field operative, Turner and the rest of the people in his office just reads books from all over the world, looking for patterns, hidden messages or even interesting ideas that might work for the CIA. His reports are usually ignored by the CIA people with more, er, interesting jobs, but he likes the gig. Then one day while he's out getting the gang's lunch order, his entire department is hit, gunned down in their offices for no apparent reason. And they're looking to complete the job by offing Turner and the other employee who happened to be away at the crucial time. Turner, not surprisingly, freaks and flees. But as he must, he contacts Langley and asks to be brought in where he can be safe. Things don't work out that way, of course, and he's left to his own devices despite being in over his head. He doesn't – can't – trust anyone and enlists (by force) the help of an innocent bystander (Faye Dunaway) to shelter him at first and, later (once her Stockholm syndrome has kicked in nicely), to help him solve the mystery behind the CIA he thought he knew and what appears to be another secret intelligence group working above and around the regular CIA. It works, without the graphic violence of Taken. Oh, there's violence, and death, but this is more a psychological thriller than straightforward action flick. The story builds well, with plenty of suspense, and there's at least one delicious twist near the end we enjoyed a lot – and which was more believable than the building romance was between Redford and Dunaway. Paramount's Blu-ray does the movie justice, though it's hardly a reference disc. The 1080p picture (presented at an aspect ratio of 2.35:1) features quite a bit of grain and the colors could be a LOT richer. The contrast also leaves a lot to be desired and there's little of that great depth the best Blu-rays exhibit. But it's better than a DVD! The audio is remixed 5.1 Dolby TrueHD and it still comes across as mostly mono. The sound is clear, but hardly the sort of soundtrack you'll want to use to impress your friends. Such is often the case with movies of older vintage. If you're expecting extras, forget it. Paramount includes the theatrical trailer, in HD, and that's it! Still, it's a worthwhile film to see and undoubtedly better on Blu-ray than any other video incarnation.